Louisville, Ky. – Monday, November 9, 2015 – Adoree’ Jackson from USC, Charles Nelson from Oregon, Christian McCaffrey from Stanford and KaVonte Turpin from TCU all return to the Paul Hornung Award Honor Roll after making big plays on offense, defense and special teams in week 10 of the college football season. Pittsburgh’s Jordan Whitehead earned his first Honor Roll selection after scoring two rushing touchdowns and leading the Panthers in tackles against Notre Dame. College football fans nationwide have the opportunity to cast their votes online for the Paul Hornung Award. 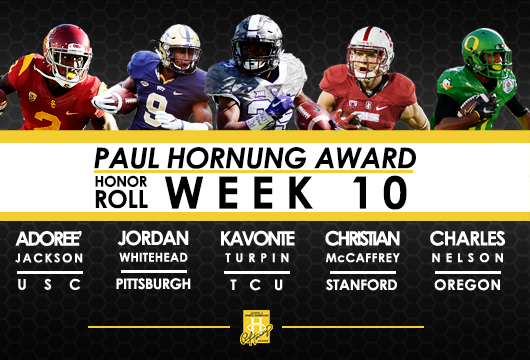 Fans can vote as often as once every 24 hours at paulhornungaward.com for players who were on the preseason watch list and players who have been named to the Weekly Honor Roll selection. Voting will continue through November 17, 2015. Fans will then have the chance to vote for the winner from among the finalists in a second round of voting in late-November. USC cornerback, wide receiver and kick returner Adoree’ Jackson continues to be a versatile threat on offense, defense and special teams as he recorded 130 all-purpose yards and two tackles in a 38-30 win over Arizona. Jackson caught four passes for 35 yards, returned four punts for 28 yards and returned three kickoffs for 57 yards. He has now surpassed 1,000 all-purpose yards and has three total touchdowns on the season. Additionally, he has 18 total tackles, one interception, one pass-breakup, two pass deflections and a forced fumble. The Trojans are tied for second with UCLA in the Pac-12 South with a conference record of 4-2 and an overall record of 6-3. Oregon safety and wide receiver Charles Nelson helped propel the Ducks to a 44-28 over California with his second offensive touchdown of the season and a solid showing on defense and special teams. The sophomore made three solo tackles on defense, hauled in a 20-yard touchdown pass on offense and returned three kickoffs for 52 yards. 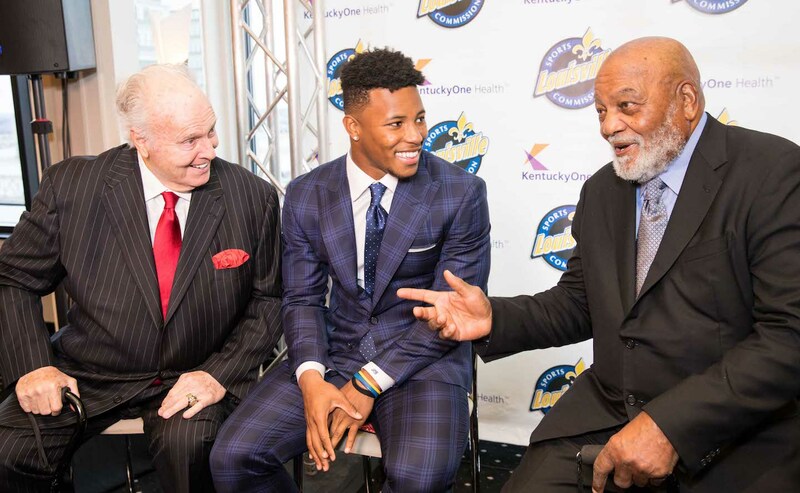 This is Nelson’s second consecutive week being honored on the Paul Hornung Award Honor Roll. He is second on the team in all-purpose yards with 705 and seventh on the team in total tackles with 33. Oregon is tied for second with Washington State in the Pac-12 South and plays division leader, Stanford, next Saturday. Stanford running back Christian McCaffrey added a passing touchdown to his impressive season after helping the Cardinal stay undefeated in the Pac-12 in a dominant 42-10 win at Colorado. McCaffrey recorded his sixth game of the season with 200 or more all-purpose yards against the Buffaloes – 147 rushing yards, 15 receiving yards, 28 passing yards and 46 kickoff return yards. His 28-yard passing touchdown was the first of his career and he is Stanford’s first non-QB to throw a touchdown since 2009. McCaffrey continues to lead the FBS in total all-purpose yardage and all-purpose yards per game with 2,174 and 241.56, respectively. TCU wide receiver KaVonte Turpin touched the ball four different ways and finished the game with 282 all-purpose yards in a 42-29 loss at Oklahoma State. Turpin ran the ball four times for 22 yards, caught seven passes for 107 yards, returned three punts for 25 yards and had five kickoff returns for 128 yards. This was his second career 100-yard receiving game and his seven catches tied a career high. Turpin is second on the team in all-purpose yards with 1,245 as a true freshman. The Horned Frogs are tied for third in the Big 12 conference with three games left, including at Oklahoma and Baylor at home to end the regular season. Pittsburgh strong safety Jordan Whitehead was a key offensive performer for the Panthers in their 42-20 loss to Notre Dame. Whitehead made his first collegiate appearance on the offensive side of the ball, lining up as a running back and wide receiver. He finished the game with four rushes for 27 yards and two touchdowns. On defense, Whitehead led Pitt with 11 tackles, including 1.5 tackles for a loss of four yards. Pittsburgh is one game behind North Carolina in the ACC Coastal division race with a conference record of 4-1 and an overall record of 6-3.